The Western Canada Hockey League was a regional competitor to the NHL during the 1920s. Similar to baseball's Pacific Coast League, it functioned as another "major league" in the West because the officially recognized league was too far away. The main difference was that it competed with the NHL and another league for the Stanley Cup championship. During the league's existence, Winnipeg-based chocolatier Paulin's offered cards of WCHL players, 1923 V128-1 Paulin's Candy Hockey, in its own packages as part of a redemption offer. 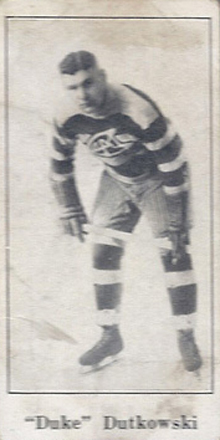 1923 V128-1 Paulin's Candy Hockey card fronts feature a black-and-white player photo. A thin black line surrounds the picture and a white border appears around the card. The player's name is listed in the border area underneath the picture. The backs have a card number and identify the name of the candy. The redemption offer is spelled out. A complete set of 70 cards could be sent to the company in exchange for a hockey stick. The following paragraph addresses female collectors and offers a box of chocolates instead for anybody who isn't interested in getting a stick. While many hobby references refer to the set as a 1923-24 issue, there is evidence to suggest these cards were released through 1926. Cards that were redeemed were cancelled and returned with the gift. As a result, cards that haven't been punched through or stamped carry a premium over those that were. Cards that are free of wear are very scarce and valuable. 1923 V128-1 Paulin's #39 George Hainsworth HOF TOUGH!! NICE!! PSA 1.5 !